If you are interested in Cushman Scooters you should join the Cushman Club of America. In addition to membership you will receive The CCOA full color magazine published four times each year. It has a listing of local, regional and national shows where you can see Cushman Scooters and a classified section listing Cushman scooters and related items for sale. It also provides technical and restoration information. Annual membership is $30.00. Send a check or money order to Linda Ciauri, Treasurer, PO Box 70, La Verne, CA 91750. Make your check payable to the Cushman Club of America. Please tell Linda that Jim, CCOA #6362 referred you. Each Recruiter Bar represents five new members that have signed up for the Cushman Club of America and given this site as a reference. Only a few of our recruiter bars are pictured. 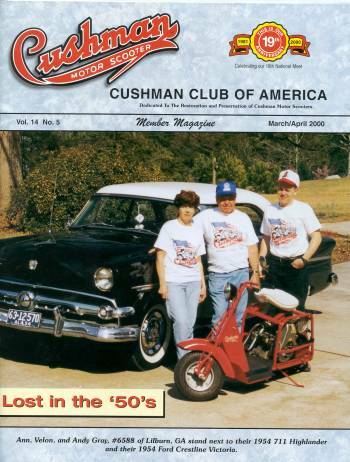 This Web site has referred over 1000 new members to the Cushman Club of America.